Friendly staff providing local product to local people!! 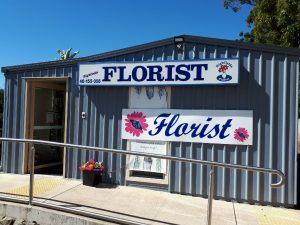 Our experienced staff are happy to assist with advice regarding the right types of flowers and arrangement to suit any occasion. Anniversary celebrations began in medieval times when people celebrated 25 and 50 years of marriage. A husband would crown his wife with a wreath of silver for 25 years and of gold for 50. The tradition of gold and silver wedding anniversaries has stuck, but there is now a long list of other named anniversaries to accompany them. Each represents a different facet of the couple’s commitment, the stage their relationship is at and the number of years they have been together. If your wedding anniversary flower is unavailable speak to your local florist for alternatives.